Some patients have what may be described as “syndromic teeth.” The size, number or crown/root morphology can indicate that the patient is affected by a recognized malformation syndrome. 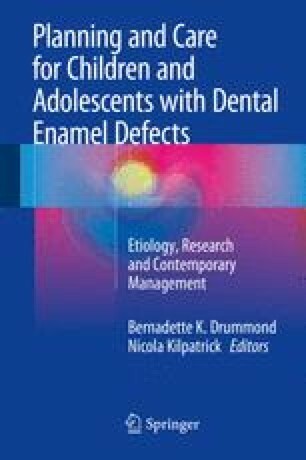 Developmental defects of enamel (DDE) can sometimes be part of a constellation of developmental changes elsewhere in the body and may even provide diagnostic clues. If the underlying condition includes processes that may affect enamel formation in more generalized, non-genetic ways, it can be difficult to be precise about the mechanism of the defect. Examples include renal disease and congenital cardiac defects, both of which can be of genetic origin and disturb enamel formation by genetic and/or pathological means. This section will describe some diseases and syndromes reported to exhibit DDE, with some guidance about whether they are likely to have direct or indirect association.